We have latest machines and cutting-edge technology thus, we ensure that the raw materials used are as per set standards and meet the international norms as well. We deliver only quality products, manufactured using the raw material. Feel free to get to approach us for placing orders and stay assured for timely and safe deliveries! 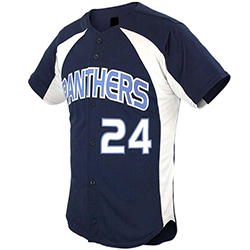 WB-1404 Baseball Jersey has a soft fabric lining with a regular fit design and high durability.